Located just 20 minutes by car from Angkor Wat, the boutique hotel managed to outrank more well-known, luxury hotel brands like the Four Seasons or Ritz, with an overwhelmingly positive approval rating amongst its 910 reviews. 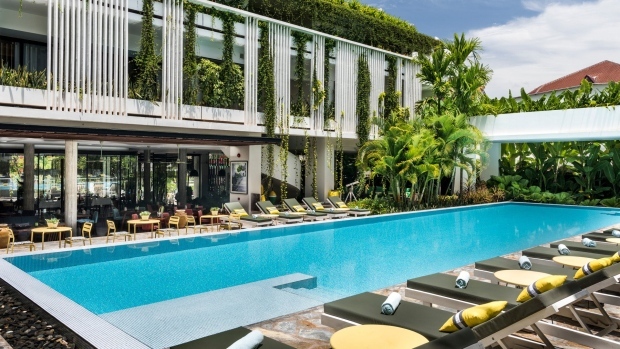 In fact, in the 2018 edition of TripAdvisor's Travelers' Choice Top Hotels in the World list, Cambodia and neighbouring Vietnam pulled off exceptional performances, nabbing three of the top 10 spots on the ranking. With a five-out-five bubble rating, Viroth's Hotel features 35 contemporary rooms and suites, gym and spa. After a day of trekking the ancient temples of the world's largest religious monument, guests can retire to the hotel and cool off in the outdoor pool oasis, which plays off the hotel's lush exterior greenery and vertical gardens -- controlled overgrowth inspired by the ancient banyan or 'strangling' trees of Angkor Wat. Satisfied customers wrote glowing reviews for the property, using words like "faultless" to describe the service as well as "immaculate," and "stunningly beautiful" to describe the property. Guests repeatedly mention the airport transfer service in a vintage Mercedes-Benz as a nice touch. Best of all, luxury comes relatively cheap in Cambodia, as rates average an affordable US$128 a night. Meanwhile, the lone North American hotel to crack the top 10 world list is The Nantucket Hotel & Resort in Massachusetts (which was also named the best hotel in the U.S. 2018).